The Guardian: "[Americans] can decide to see the world in a new light, full of potential partners as well as enemies, or remain in the Bush crouch of permanent warfare." Daily Telegraph: "Why is it that the choice between Barack Obama and John McCain remains peculiarly unsatisfactory? Is it because one promises too much while the other has delivered too little and, as a result neither candidate quite convinces? Senator Obama is charismatic but alarmingly vague while his challenger is politically sound but unnecessarily peevish....... a leap of faith or playing it safe? In short, is America ready to take a gamble?" The Independent: "What is certain is that Mr Obama provides excitement, a desperately needed jolt of political electricity. If he is elected, America will instantly be seen in a new light around the world - not just because the unloved George Bush is gone, but because the country has found it within itself to turn to someone truly new, whose astonishing ascent could have happened nowhere else on Earth. Only in America." The Daily Mail: "Mesmerising though Obama's speeches may be, they have told us very little about either his policies or his principles. With his gifts for acting and oratory, there may be rather too much of the Tony Blair about him for many people's tastes......... 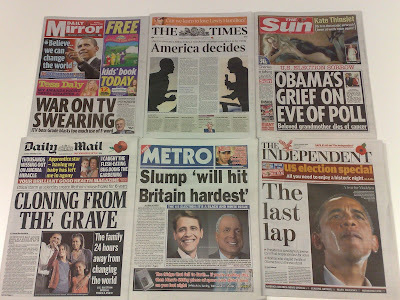 But the Mail firmly hopes that tomorrow morning, the US will have its first ever black President-elect." The Sun: "John McCain has been toughened in battle but has little economic expertise. Barack Obama is a brilliant orator but has no experience of top-level politics, let alone the raw power of high office. Both men promise 'change.' We are at a pivotal moment in World history. For all our sakes, the American people need to get this one right." Daily Star: "The charismatic Barack Obama is a racing certainty to become the first black President of the States. He has had an easy ride as his opponent John McCain is one of the worst candidates in history. The 72-year old with the Bobby Charlton haircut and dentures is way past his political sell-by date. Isn't it amazing that in a country of 300 million people, this relic is the best the Republican party could find?" The Times: "Americans have been provided with a real choice and an exciting contest..... This election shows that democracy retains its ability to inspire." Daily Mirror: "In Barack Obama, the US has found a true 21st century leader and an opportunity to rescue his country's reputation and standing in the World." "Today America needs to do the right thing, for itself and for us all. To vote Barack Obama the next President of the United States." UK newspapers are generally not scared to declare an opinion, especially about politics. It is a little surprising therefore, that after 21 months of campaigning, more of them aren't firmly declaring support for one or other of the candidates - even those supporting Obama seem to have caveated / qualified their support for him. 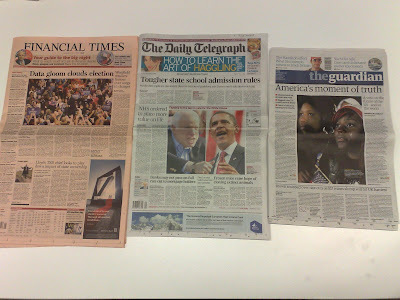 The consensus in UK newspaper editorial is that Obama is the best choice, but it is by no means overwhelming.